Its time to get ready for Advent and Christmas. Decorations, trees, lights and gifts are already prominently displayed in the stores encouraging us to buy early and be ready for the consumer frenzy to follow. So how do we keep our focus on what really matters at this season? Here are some practices I have found helpful. 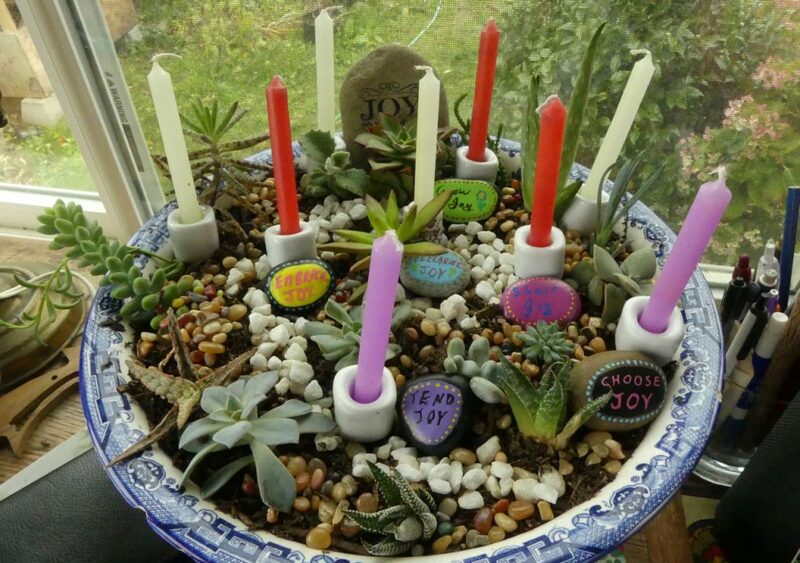 I usually start my preparation for Advent and Christmas by creating a new sacred garden for the season. However, as I sat and reflected on this today I realized that there is a step that needs to precede this. I need to centre my life each day on the indwelling presence of God. This is particularly important during busy seasons of distraction. For the month of November I have instituted a spiritual practice that I believe will reshape my sacred space into a profound place of encounter with God during the Advent and Christmas season. I begin by sitting still with my eyes closed for a couple of minutes taking deep breathes in and out. Sometimes I read through one of these breathing prayers or this one that I have written in the past. 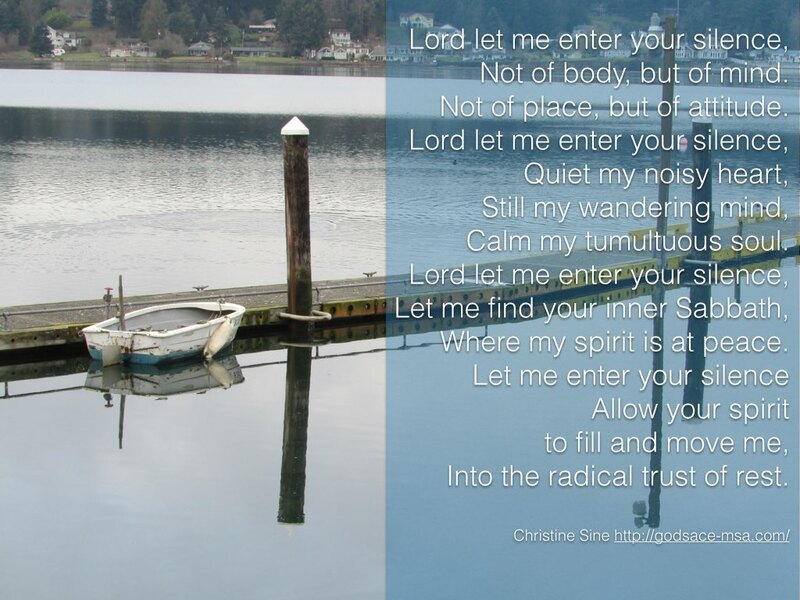 When I feel my spirit is a peace I recite the centering prayer above, aloud, several times and imagine myself sitting in the centre of God’s love. Reciting prayers aloud engages our whole being at a deep level. The words resonate throughout our whole being and lodge more deeply in our hearts. I then ask: What would I like God to accomplish in my life during Advent and Christmas? or In what ways do I want to draw close to Christ during this season? I use this exercise at the beginning of the day and then again at the end. My whole day is embraced by God’s centering love and it helps me establish important priorities for the season without feeling stressed out and pressured. Question: How would you like to draw close to Christ during Advent and Christmas? What is one practice you could establish now to help accomplish that? The stores are right we do need to begin early with our preparations for Advent and Christmas, but the place to start is not with consumerism in fact quite the reverse. I am convinced that clutter distracts and unsettles us so that we feel we need more stuff in order to be satisfied. Is there a space that you like to use each day for your spiritual practices? Sit in this space for a while and allow yourself to relax without any specific spiritual practice in mind. Are there objects that catch your attention and draw you away from the presence of God? Does it contain clutter that distracts you and makes you think about your next shopping trip, eating binge or party plan? If possible remove these items. Now think about what makes your place comfortable as a place of prayer. Do you need to add a candle, a prayer card, an icon or other symbol that reminds you of the purpose of your journey towards Christmas and the birth of Christ? Question: What are one or two things you could do to create a more God focused, relaxing and uncluttered sacred space? This is a very serious November task for me. Out of my November practices I create a new sacred space for Advent. In the last few years this has been an Advent garden, but as Tom and I will be in Australia for the entire month of December that may not be practical this year. I am already sensing a theme that God wants me to focus on (more of that next week) but how to keep that in focus while I travel and spend time with friends and relatives I am not sure of. It’s time to get my creativity hat on! You might like to use traditional symbols of Advent: wreaths, candles, mangers and music to create a focus for the season, but you don’t have to. In fact because these have become so much a part of the secular lead up to Christmas, they can distract us and draw us away from Christ rather than towards him. Question: What would you like to be the focus of your Advent and Christmas? What is one object you already have or could create that reminds you of the Christ child entering our world? How could you use this to help you maintain your focus during Advent and Christmas? Now is the time to take control of your schedule throughout the Advent and Christmas season. Before you fill your calendar with busy Christmas events and trips to the mall schedule some alone time for renewal and refreshment. So often self care is at the bottom of our list of priorities during this season when it should be at the top. What most refreshes you and draws your attention back to God and the real meaning of the Advent and Christmas season? For me it is five minutes of centred prayer each morning and evening and a half day or longer retreat at least once during December. If we don’t get these type of practices on our schedule early they will never happen and this will become yet another stressed out Christmas season. I encourage you to schedule some away time now during the month of December for rest and refreshment. It might just be a half day but I think you will find it an invaluable practice. Question: What is one practice you need to get on your calendar now for the Advent and Christmas season to help you maintain an ordered and balanced approach to the season? There are an amazing array of Advent devotionals around and the number grows each year. There are also a lot of Advent/Christmas scripture reading plans too. Tom and I love to read the scriptures in the daily lectionary but Godspace posts a list each year of other possible reading plans and devotionals. The links here go to last year’s lists, but keep your eyes open for these to be updated in the next week or so. Question: What Bible readings would you like to institute during the Advent/Christmas season.? What other reading would assist you in your journey towards the manger? If you practice sabbath throughout the year, Advent and Christmas is not a season to let go of this habit. In fact protecting it should be one of your priorities. There might be changes you want to make for the season. There might be special practices and activities you want to incorporate, but whatever you do don’t let go. Question: What steps do you need to take in order to protect your Sabbath day during the Advent/Christmas season? Celebrate your faith not the culture. Question: What celebrations could you incorporate into your Christmas and Advent seasons in order to maintain a Christ focus? We don’t need to allow the pressures of the culture to consume us this Christmas. We can take back our time and our resources and discover the joy of a true Christ centred celebration. Wonderful practices. Thank you for the reminder Christine.